Could so narrow-minded a man, I was in effect asked, become pope? I argued that Ratzinger was well-known to each of the cardinals and that, he more than any other, had the best chance of being elected. I allowed, however, that perhaps “a friendlier version” of Ratzinger could be elected, and speculated that perhaps this might be “Bergoglio of Argentina.” I was about eight years off. So, on a rainy March evening in Rome last year, finding myself unexpectedly once again present for a conclave, I was familiar with the man who would walk on to the loggia of St. Peter’s Basilica. Nonetheless, this pope of many firsts (the first to take the name Francis, the first Jesuit, the first from the Americas) was ready with a number of surprises of his own. For those of us who follow the papacy, Pope Francis provides a constant stream of material for reflection. 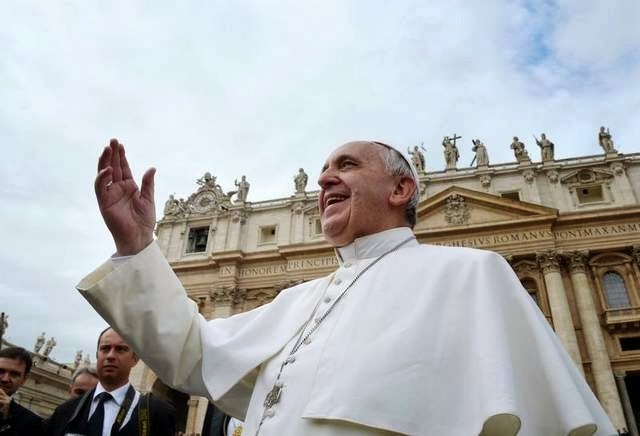 For commentators accustomed over the past 30 years of explaining the meaning of dense theological and philosophical magisterial texts which were the norm prior to this pontificate, the simplicity and spontaneity of Pope Francis’ style can be confusing and somewhat deceptive. Whereas his predecessor had largely taught in very precise words and nuanced argument, Francis speaks boldly through effective and moving gestures. One tender and manifestly genuine embrace of a deformed man is worth an entire encyclical on love. And in the age of the Internet, it is more instantly accessible to millions of people. It is no surprise that the man who took as his model and name the model of il poverello of Assisi would place the poor as a central concern of his pontificate: their dignity, their rights and their sustenance. Yet, the spontaneous gestures and the impromptu manner in which they are displayed ought not to beguile us into thinking this pope is offering a superficial dichotomy between left and right; between capitalism and socialism. To think that any pope, but especially this pope, is animated in his concern for the poor and vulnerable by a particular political ideology is to miss him completely. While renouncing the notion that the market alone is sufficient to meet all human needs, Francis is also prepared to denounce a “welfare mentality” that creates a dependency on the part of the poor and reduces the Church to the role of being just another bureaucratic NGO. The complexity of his thought surprises some, on both the Right (some of whom worry, needlessly, that he is a liberation theologian) and the Left (who are already using his words to foment a political “Francis Revolution” in his name). Such tendencies reveal a rather anemic understanding of this man but also of Catholicism, which has historically been comfortable balancing the tensions of apparent paradoxes (Divine/human; Virgin/Mother; etc.). It is too facile a temptation to collapse 2,000 years of tradition, commentary and lived experience into four or five politically-correct hot button sound bites that are the priority, not of the Church, but of propagandists with an agenda. We cannot respond with truth to the challenge of eradicating exclusion and poverty if the poor continue to be objects, targets of the action of the state and other organizations in a paternalistic and aid-based sense, instead of subjects, where the state and society create social conditions that promote and safeguard their rights and allow them to be builders of their own destiny. As one who has promoted a free economy as a normative way to assisting people out of poverty, I find two innovative challenges in these words which could go a long way to depoliticizing the debate about wealth and poverty. The particular details of policy prescriptions are not the heart and soul of Francis’ incredible attraction on the part of people throughout the world. It is not his political motivation that moves us as we witness his embrace by — and of — frail human life. In a monumental and unanticipated way Pope Francis is changing the tired conversations of the past and inviting us to engage in a process of healing so desperately needed in our world today. Almost single-handedly he is changing the way in which people view Catholicism, not by changing Catholicism, but by retrieving many of its own treasured traditions and putting them out front. His strategy comes from his view of the Church and it is not secret. It is simple, and he stated himself clearly. He sees the Church as a field hospital after a battle. Heal the wounds, yes. And then awaken society to the greatest resource of all: the human person. That is the path out of poverty. This post originally appeared in The Detroit News.